Afzelia bella is widespread, occurring from eastern Guinea and Liberia east to the Central African Republic, and south to DR Congo and Cabinda (Angola). Like other Afzelia spp., the wood of Afzelia bella is characterized by an excellent stability with little susceptibility to variations in humidity, small shrinkage rates during drying and a good natural durability. The wood is durable and treatment with preservatives is unnecessary, even for usage in permanent humid conditions or in localities where wood-attacking insects are abundant. This makes it an excellent wood for use in pleasure-crafts, especially for keels, stems and panels, for bridges, as well as interior fittings. For such uses it is sometimes as much in demand as teak. The wood is also valued for joinery and panelling, both interior and exterior, parquet floors, doors, frames, stairs, vehicle bodies, furniture, sporting goods, mine props, musical instruments, railway sleepers, agricultural implements, utensils, tool handles, turnery, fibre board and particle board. It is suitable for decorative sliced veneer. Because of its good resistance to many chemical products and great dimensional stability, it is often preferred to materials like metals and synthetics for vats and precision equipment in industrial applications. The neutral pH of the wood makes it suitable for applications in contact with vulnerable objects such as antiques and old books in libraries. However, it should not be used in contact with textiles under more humid conditions because of the presence of colorants. The wood is also used as firewood and for charcoal production. The leaves are sometimes eaten cooked as a vegetable. Livestock browses on the foliage. The seed aril is edible and reportedly sweet. Bark and sometimes roots and leaves are used in traditional medicine. Bark decoctions and macerations are taken to treat intestinal parasites, diarrhoea, menstruation problems, haemorrhoids and rheumatism, and as tonic. Ground bark is applied externally against skin diseases. Leaves are administered against constipation. The tree is decorative and sometimes planted as ornamental shade tree. Afzelia bella is not the most important Afzelia species for the international timber market. Its wood is often mixed with that of more commonly traded species such as Afzelia bipindensis Harms and Afzelia pachyloba Harms, and traded as ‘doussié’, for which Cameroon is the main exporting country. In 2003 Cameroon exported 9900 m³ of sawn doussié wood and 47,750 m³ in 2005. However, the share of Afzelia bella in these amounts was probably small because it is usually a small-sized tree in Central Africa. Exports from Côte d’Ivoire declined strongly in 2007 and 2008 because of dwindling stands and the economic crisis in importing countries. In 2005 Ghana exported 9000 m³ of sawn Afzelia wood (as ‘papao’), and 7000 m³ in 2006 at an average price of US$ 780 per m³. The heartwood is orange-brown to golden brown, becoming red-brown upon prolonged exposure, sometimes with darker streaks. It is distinctly demarcated from the whitish to pale yellow, up to 8 cm wide sapwood. The grain is straight to interlocked, texture medium to coarse but even. The wood is slightly glossy and dried wood has a leather-like smell upon planing. The wood is medium-weight to fairly heavy, with a density of 700–840 kg/m³ at 12% moisture content. Drying usually does not cause problems, without deformation and splitting, but the wood dries rather slowly. For thick boards (more than 7.5 cm), preliminary air drying under cover is recommended before kiln drying. The shrinkage rates are low, from green to oven dry 3.1% radial and 5.5% tangential. Once dry, the wood is very stable in service. At 12% moisture content, the modulus of rupture is 90 N/mm², modulus of elasticity 12,500 N/mm², compression parallel to grain 60–85 N/mm², shear 6.5 N/mm², cleavage 17 N/mm, Janka side hardness 6000 N and Chalais-Meudon side hardness 4.3. The wood saws easily when good equipment is used; it contains little silica (less than 0.015%) and stellite-tipped saw teeth are not needed for sawing fresh wood. Some logs have gum pockets, which may cause problems in sawing by blunting saw teeth. Tungsten-carbide-tipped cutting tools are recommended in planing and moulding operations. It is advisable to reduce the cutting angle to 15° to avoid rough surfaces when interlocked grain is present. The use of a filler is recommended to obtain smooth surfaces. The nailing and screwing properties are satisfactory, but pre-boring is recommended to avoid splitting. Gluing usually does not cause problems. The wood paints and varnishes well, but wood zones close to the centre of the log may contain anti-oxidant substances that slow down drying of varnish and may cause problems in painting. Sliced veneer of good quality can be produced, but the wood is not suitable for peeling. The wood has a good reputation for its resistance to acids and alkalines. The heartwood is durable, with an excellent resistance to fungal, termite and borer attacks, but it is liable to marine borers. 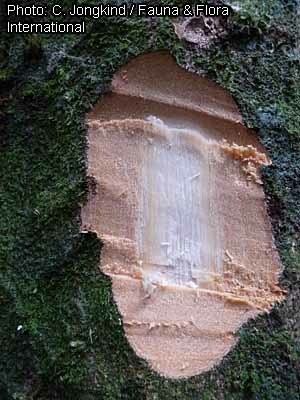 The sapwood is susceptible to Lyctus attack. The heartwood is resistant to impregnation with preservatives. Saw dust may cause allergic reactions, irritation of mucous membranes and asthma in wood workers. Logs may have crevices filled with a whitish powdery substance originating from the wood vessels; the substance consists of kaempferol and derivatives. Kaempferol and its glycosides have antibacterial, antifungal and anti-inflammatory activities. These compounds have also been isolated from the bark together with other flavonoids and glycosides. Although anti-nutritive and toxic compounds have been reported for the leaves, the foliage can be used as fodder because the level of these compounds is low. After a test of rumen degradation by goats, the foliage of Afzelia bella was even ranked as high-quality forage. The seeds contain about 7% water, 13% protein, 54% carbohydrate, 23% lipid and 3% ash. The energy value is 2190 kJ per 100 g. The seed oil contains crepenynic acid and dehydrocrepenynic acid. Crepenynic acid is a potential inhibitor of essential fatty acid metabolism, and proved toxic to sheep. Dehydrocrepenynic acid acts as inhibitor of conjugation in gram-negative bacteria, which may provide a means to control the spread of antibiotic resistance. The wood of three other Afzelia species is similar to that of Afzelia bella and also traded as ‘doussié’: Afzelia africana Sm. ex Pers., mainly exported from West Africa, and Afzelia bipindensis Harms and Afzelia pachyloba Harms, mainly exported from Central Africa. The excellent properties of Afzelia bella wood concerning dimensional stability and high natural durability are comparable to some well-known timbers such as merbau (Intsia spp.) and teak (Tectona grandis L.f.), and to the African makore (Tieghemella heckelii (A.Chev.) Roberty) and douka (Tieghemella africana Pierre). Evergreen or deciduous shrub or small to medium-sized tree up to 25(–35) m tall; bole straight and cylindrical or irregular, up to 100(–150) cm in diameter, often with unequal, small buttresses; bark surface brown to orange-brown, superficially scaly, with hoops or plate-sized scars of swirly concentric rings, inner bark granular, yellowish to pinkish, with gritty orange streaks, with yellowish brown exudate, aromatic; crown elongate to rounded or flattened depending on age and growing conditions, with tortuous, more or less upright branches; twigs slightly hairy to glabrous. Leaves alternate, paripinnately compound with 3–6 pairs of leaflets; stipules with basal parts fused and persistent, upper parts free, linear and caducous; petiole and rachis together 6–18 cm long; petiolules 1–6 mm long, often slightly twisted; leaflets opposite, elliptical to elliptical-lanceolate, 4–16 cm × 1.5–7 cm, obtuse to short-acuminate at apex, usually glabrous, pinnately veined with 7–13 pairs of lateral veins. Inflorescence a terminal or axillary panicle up to 25 cm long, usually short-hairy. Flowers bisexual, zygomorphic, sweet-scented; pedicel 0.5–1 cm long; bracteoles c. 0.5 cm × 0.5 cm, caducous; hypanthium 1–2.5 cm long; sepals 4, 1–2.5 cm long, densely short-hairy; petal 1, 4–6 cm long, with long claw, 2-lobed, white to pink with red marking in the centre; fertile stamens 7 and 3–4 cm long, rudimentary stamens 2 and c. 1.5 cm long; ovary superior, c. 1 cm long, with short stipe, slightly hairy, style c. 4.5 cm long. Fruit a kidney-shaped, flattened pod 10–12 cm × 4–5 cm, dark brown to black, dehiscing with 2 woody valves, (1–)3–15-seeded. Seeds ellipsoid or oblong-ellipsoid, 2–3 cm long, black, with 2-lobed, orange to red aril covering the seed for c. 2/3. Seedling with epigeal germination; hypocotyl 6–11 cm long, epicotyl 8–12 cm long, glabrous; cotyledons fleshy, oblong, 2–3 cm long, erect; first 2 leaves opposite, with 3 pairs of leaflets. Afzelia comprises about 11 species, 7 of which occur in tropical Africa and 4 in South-East Asia. It is closely related to Intsia. Three varieties have been distinguished in Afzelia bella: var. 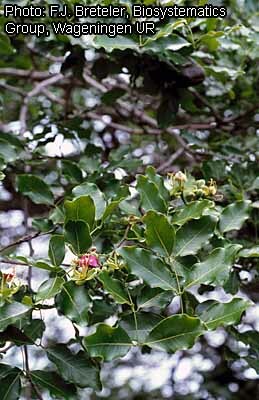 graciolor Keay, occurring from Côte d’Ivoire to Ghana and becoming a medium-sized tree with comparatively small leaflets and flowers; var. bella, occurring from Nigeria to DR Congo and Cabinda (Angola), an understorey shrub or small tree up to 12 m tall, rarely taller; and var. glabra Aubrév. from Congo with glabrous inflorescences. Afzelia bella is close to Afzelia bipindensis Harms, which is usually a much bigger tree. 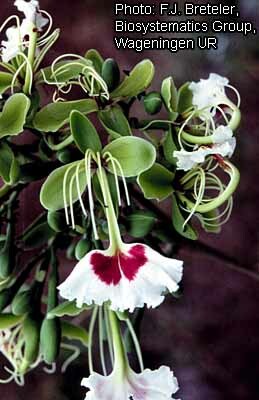 However, in Côte d’Ivoire and Ghana (where Afzelia bipindensis does not occur) Afzelia bella can also reach large dimensions. Afzelia parviflora (Vahl) Hepper (synonym: Afzelia bracteata Vogel ex Benth.) occurs in Guinea, Sierra Leone, Liberia and western Côte d’Ivoire, in evergreen and moist semi-deciduous forest, often along rivers. It differs from Afzelia bella in its leaflets, which are usually more rounded at apex, in its larger, more or less persistent bracts (small and early deciduous in Afzelia bella), and in its petal, which is carmine red inside. Afzelia parviflora is a small to medium-sized tree up to 30(–35) m tall with bole up to 50(–100) cm in diameter. Its wood is similar to that of Afzelia bella, with a density of about 790 kg/m³ at 12% moisture content, and is used for similar purposes, and traditionally for canoes. The bark is used in traditional medicine to treat onchocerciasis. Pounded seeds are reportedly an ingredient of soup. Growth rings: 1: growth ring boundaries distinct. Vessels: 5: wood diffuse-porous; 13: simple perforation plates; 22: intervessel pits alternate; 23: shape of alternate pits polygonal; 26: intervessel pits medium (7–10 μm); 29: vestured pits; 30: vessel-ray pits with distinct borders; similar to intervessel pits in size and shape throughout the ray cell; 42: mean tangential diameter of vessel lumina 100–200 μm; 46: ≤ 5 vessels per square millimetre; 47: 5–20 vessels per square millimetre; 58: gums and other deposits in heartwood vessels. Axial parenchyma: 80: axial parenchyma aliform; 81: axial parenchyma lozenge-aliform; 83: axial parenchyma confluent; 89: axial parenchyma in marginal or in seemingly marginal bands; 91: two cells per parenchyma strand; 92: four (3–4) cells per parenchyma strand. Rays: 97: ray width 1–3 cells; 104: all ray cells procumbent; 115: 4–12 rays per mm. The growth of Afzelia bella is slightly slower than that of Afzelia africana. In plantations on cleared sites in evergreen forest in Côte d’Ivoire, the average height of trees was 13–15 m 17 years after planting, with a mean bole diameter of 15.5–19 cm. In Côte d’Ivoire trees flower in October–December and fruits mature in December–March. In Ghana trees flower in the dry season, before losing their leaves and ripe fruits develop towards the end of the dry season. The roots are associated with ectomycorrhizal fungi. In Côte d’Ivoire and Ghana, Afzelia bella usually occurs in moister forest types, in evergreen as well as moist semi-deciduous forest. It is often found on slopes and in slightly swampy localities. 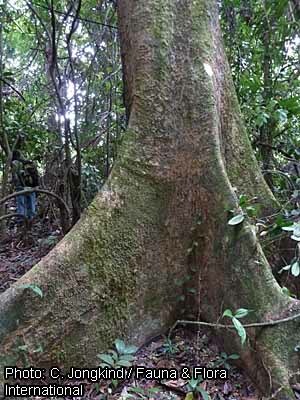 In Cameroon, Gabon and DR Congo Afzelia bella occurs as understorey shrub or small tree in primary as well as secondary forest on well-drained localities. Natural regeneration of Afzelia bella is usually in the shade. There are 600–700 seeds per kg. 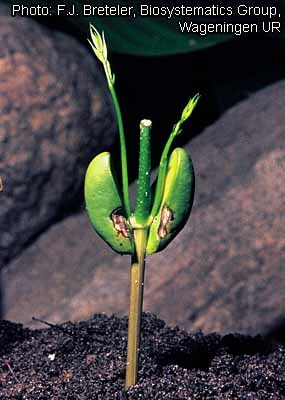 The germination rate of fresh seed is high, and germination starts 1–3 weeks after sowing. Tests in Côte d’Ivoire showed a high mortality in planted seedlings, up to 70%. Afzelia bella usually occurs scattered, rarely in small groups. The minimum bole diameter for harvesting is 50 cm in Côte d’Ivoire, 70 cm in Gabon and 80 cm in the Central African Republic. Prolonged stocking of logs after harvesting does not cause problems except occasional black holes in the sapwood caused by borer attacks. Logs of Afzelia bella are too heavy to be transported by river. Afzelia bella is not threatened by genetic erosion because it occurs widespread and is locally common, particularly in Central Africa. Moreover, it is not exploited on a large scale. The large variation in the size of the trees, with seemingly regional differences, is remarkable. Differences in wood properties between provenances have also been recorded. Afzelia bella may have prospects as a commercial plantation timber, although it does not grow rapidly. The high value of its wood makes it economically interesting. The large variation in tree habit and size, and in wood properties warrant research on its genetic diversity and breeding for superior characteristics. The seeds may be a useful nutrient source for humans and animals, but further toxicological studies are needed. Pharmacological studies are needed to support the uses in traditional medicine. The tree has ornamental value. Gérard, J. & Louppe, D., 2011. Afzelia bella Harms. In: Lemmens, R.H.M.J., Louppe, D. & Oteng-Amoako, A.A. (Editors). PROTA (Plant Resources of Tropical Africa / Ressources végétales de l’Afrique tropicale), Wageningen, Netherlands. Accessed 14 April 2019. This page was last modified on 23 March 2017, at 16:36.